Have you had one of those dreams where the things close to you are clearer than anything around the edges? But even though they seem clear, the harder you try to look at them, the more you can’t see them? Everything seems on the periphery, just out of reach. Then, just when you don’t look, it comes into focus. That’s what reading this book was like for me. I had no expectations about it, and honestly, didn’t even remember what it was about. At first, the fuzziness was annoying – what’s the time period? Where does this take place? Who are these people? I felt like there were too many set ups for surprises and mysteries with no answers. Then, just when I least expected it, I fell into the rhythm of the book and found myself drifting along with it. Like wading through honey. Slow and thick, but not unpleasant. No matter that I didn’t understand everything – to be honest, I still don’t. There were parts I liked better than others. But, that’s just it – I liked it. Here’s the thing – I am not even sure if I can give you a succinct explanation of the story. It begins with the funeral for a beloved brother, a new boy in town named Lewis, Hotbloods and Cools and Wilds, a Nether creature, souls being lost and souls being appropriated. Seems these groups of people (not even sure if they are human?) sometimes get along and sometimes don’t. Regular people don’t know of their existence. What I do know is Dariana’s brother has died. Most people figured she would go first, seeing that her brother Devlin stole her soul ten years ago. She never should have lasted that long without one. Compelled to go out for a walk one evening, she comes across someone who can actually see Dari’s soul outside her body. When they kiss, she takes his soul. Somehow, though, Lewis lives. Is it the Nether, a shadow that smells of death and dying leaves and decay? All Dari knows is she feels more alive and volatile than she has in years. Taking that soul has made her a Hotblood. Surrounded by her mother’s family, who are Wilds, Dari has to learn to control her urges when it comes to pulses, heartbeats, blood and life. Spending the summer with her father, a Cool, helps. With the aid of her family and friends Snowy, Osmond, Smoke and Ash, Dari slowly comes out of her years of a coma-like existence. She’s been reborn and it’s like she it getting used to being in her body again – a body that now contains a different soul. But what of Lewis? He’s there, but not there. She thinks she likes him, but then is not sure. He’s calm, beautiful…but can she trust herself, her Hotblood self, around him? This is Dari’s coming out party of sorts. She’s been the zombie for so long that now it’s time to live. She wants color and excitement in her life. For the first time, she can taste the vitality that has been missing. She no longer exists on the fringes but is the sun. But once she finds out what happened to her brother and who is responsible, will this sun collapse in on itself? 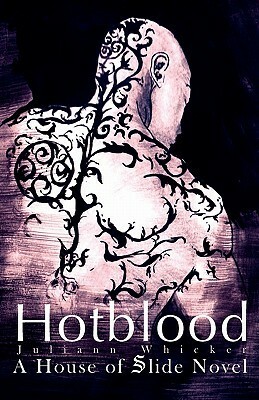 Hotblood (A House of Slide Novel) by Juliann Whicker was published May 12, 2012 by CreateSpace. A free copy of this book was given to Ink and Page in return for an honest review.